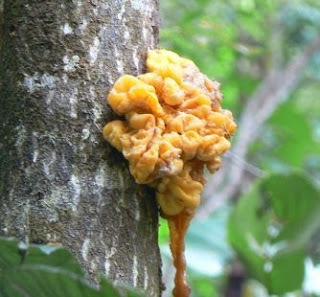 Daintree Valley Haven: Fungus or Resin? Saw this amazing sight on a tree-trunk (species unknown) the other day - it was just too high up to touch and at first I thought it was some kind of fungus. After such a wet, Wet season they are everywhere and come in all sorts of shapes, colours and sizes. But it almost looks as if there's a sort of drip-effect at the bottom so perhaps it's a resin oozing out of the trunk.